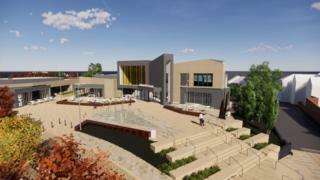 Plans for a £12m cinema and restaurants in the heart of a Northamptonshire town have been approved by a local council. The Mulberry Place scheme will see a four-screen cinema with two restaurants and a public square on land north of the High Street, Daventry. However, £75m plans for a larger redevelopment scheme are being put on hold after the project's private backer Henry Boot Developments pulled out. These plans, including new shops and offices, were first proposed in 2005. A report prepared for Thursday's full council meeting stated "market conditions" meant the project, sited in the Waterloo, Gasworks and Chaucer Way area, was not viable. Daventry District Council said on Thursday it was looking at alternative ways to regenerate this area. David James, Daventry District Council's Conservative portfolio holder for regeneration, said: "The council recognises the substantial investment made by Henry Boot and regrets that this partnership will need to come to an end. "However, we do have a range of stores who want to come to Daventry, and the council will explore how best to make this possible. "In the meantime, the council's work on the cinema and restaurants at Mulberry Place will press on." Vivienne Clements, director at Henry Boot Developments, said: "While interest from national retailers has been encouraging, market conditions and infrastructure costs have unfortunately made the scheme unviable." Work at Mulberry Place is expected to start in the summer.